Springtime always made him melancholy. It did that to everyone in AVALANCHE really, but Tifa notice that it affected Cloud the most. He'd never say a word about it, but his depression would hang in the air like a heavy fog. She knew it was because of Aeris. Because the springtime made him think of her more than any other time. The near disaster with Kadaj, and the resurrection of Sephiroth wasn't helping his condition this spring either. Cloud was deeper in thought than he had any right to be, all the time now. As she watched him spend another hour attempting to repair his motorcycle, she realized that she missed the Cloud Strife that had hired into AVALANCHE, even as she felt love for this much more thoughtful, slightly broken one. Personal Quote: We love the spiky blond-haired, blue-eyed goodness! Favorite visual artist Tetsuya Nomura Favorite movies Final Fantasy VII: Advent Children Favorite bands / musical artists Nobuo Uematsu Favorite games Final Fantasy 7 and Kingdom Hearts and FF7: Before Crisis Favorite gaming platform anything console that you can play FF7 on! Other Interests stalking and glomping Cloud! Welcome all you Cloud Strife fangirls (and fanboys)!!! This is a club made especially for those who like Cloud and enjoy stalking him. 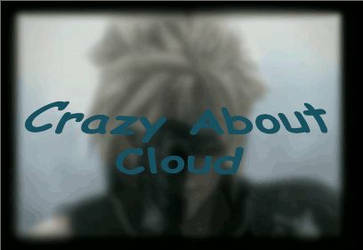 So join today if you love Cloud! You must like Cloud Strife. Please be kind to other members! No flaming!!! Spread the love of Cloud! Tell others about the club! Can I join? How can I?? I put the icon of the club in my journal! hiya, want 2 join yer club. hey, i LOVE cloud strife, can i join? Hi. I'm a rabid Cloud Strife fangirl. You guys rock. Can I please join? I´m a big fan of him!!!! *¬* love him so much!!! !